We're very proud of our Rosmeria bouquets which is why we thought we'd showcase them in today's blog post. An inspired fusion of roses and alstroemeria, our Rosmeria arrangement is available in a choice of six compelling colours; choose from either warm and radiant orange, pretty peach, elegant cerise, passionate red, bright and cheerful yellow, or classical and eloquent white. Each bouquet is tastefully decorated with green leaves to offset the vibrant hues of the petals. This versatile and instantly eye-catching bouquet is perfect for all sorts of occasions. The range of colour options can be used to imply different meanings; for example yellow represents good cheer, optimism and friendship and therefore would be ideal for a best friend's birthday or a good luck gift. Red is, of course, the colour of passion and love making our Red Rosmeria great for anniversaries, for getting the attention of a workplace crush or for any other amorous occasions. Each of our Rosmeria bouquets comes inclusive of completely free standard next working day delivery. If you'd like your flowers sent on a weekend, we can provide Saturday or Sunday delivery for a small surcharge. Our £5 deluxe option is available - for only £5 more you can add 50% more flowers to your bouquet which is phenomenally good value for money when you think about it. 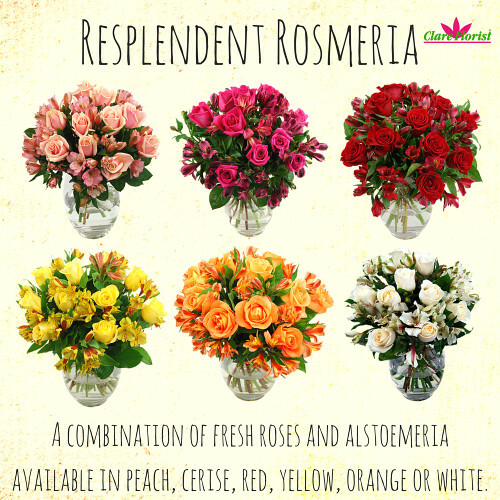 Which colour of Rosmeria is your favourite?